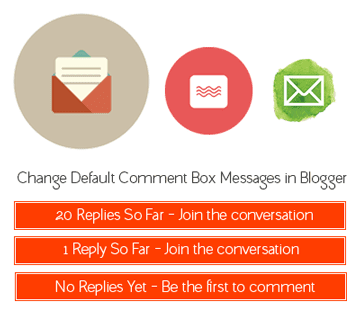 We all love the feeling of having new comments below our blog posts and to increase the chances of having more comments, we install many other third party commenting systems like as Facebook comment system, Google+ comment system, and Disqus comment system . But still the majority of bloggers who blog on Blogger platform prefer using blogger's default system of commenting. 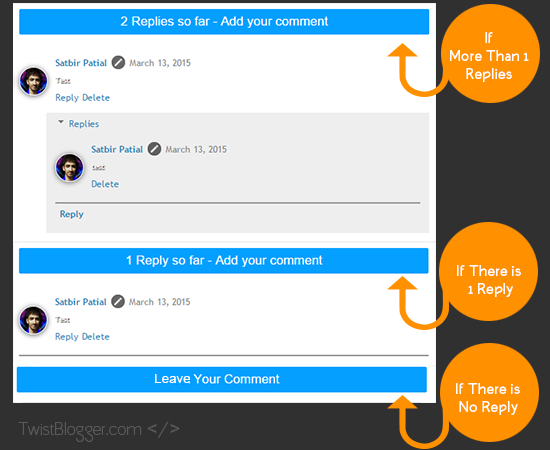 Even this blog also uses only blogger's default commenting system. Although we have changed a few things to make it look better and meet the theme design. The most annoying thing we need to change is those text strings appear before the comment box like as "0 Comments" when there is no comment, "2+ comments:" and "Post your comment". This is what we are going to deal with thoroughly in this post. We will change them to whatever Message we want to appear in whatever style using CSS. We can use the images too. First of all be ready and just login to your blogger account >> select your blog >> go to Template section >> click on Edit HTML >> . Now click anywhere inside the template code box and save a backup of your template in your desktop. Now press Ctr+F on Windows OS or Cmd+F on Mac OS to open up a search box inside the template code box (Click inside code box first to open search box inside it). Note: Please, have patience and read carefully otherwise you'll face problems of not working. I am providing a solution for both templates. I mean third party custom template or blogger's default template. This above code is liable to generate 0 Comments message. You will find this whole code two times so you have to take care of it that you do change as given below to both codes. Now we will wrap it up with a conditional tag so that this message only appears if there is one comment or two and disappears when there is no comment. Please read editing step carefully given just below the code. Editing: Conditional tag is highlighted in YELLOW color which will not let the message "0 Comment" appear when there is no comment. Code highlighted in RED color is the very important step to edit. This is the message you want to appear when there is 1 comment or more than one. First Highlighted message is singular means for one comment and the second message is for plural means when there are more 2 or more comments. So change them as you like it replace the code above with this one. Wait, Did you find the code above or Not? If you're using a third party template code then you must find out this code. Just type <h4> in search box and hit enter. Did you find this code now? If not then just search for another code given below and replace it with the code given above. This time you can't really miss it. Replace this whole code if found with the code given above it. You may find this code twice so do the same for two times. Now this message will appear when there is no comment to your blog post, right? You can change it too with whatever text you like or even you can use an image instead. You need to find out the HTML code given below. Tip: Press Ctrl+F and paste this code <h4 id='comment-post-message'> in search box to find this long piece of code easily. Editing: To make changes, just follow the comments I have added to CSS style code in front of every line which says itself what you can change there. Final Step: Do not forget to save the template :) and please Do Reply whether it worked for you or not. I wait eagerly to help you as soon as you post in comments. If you want to use images instead of these texts messages, then let me know. I will surely come up with another twist for you. Stay blessed.